Every aspect of dog training should start with a firm intention: what exactly do you want your dog to do (or not do). For example, some people don’t mind if their dog sleeps on the couch; others do not want their pet to even look at the furniture let alone sit on it! 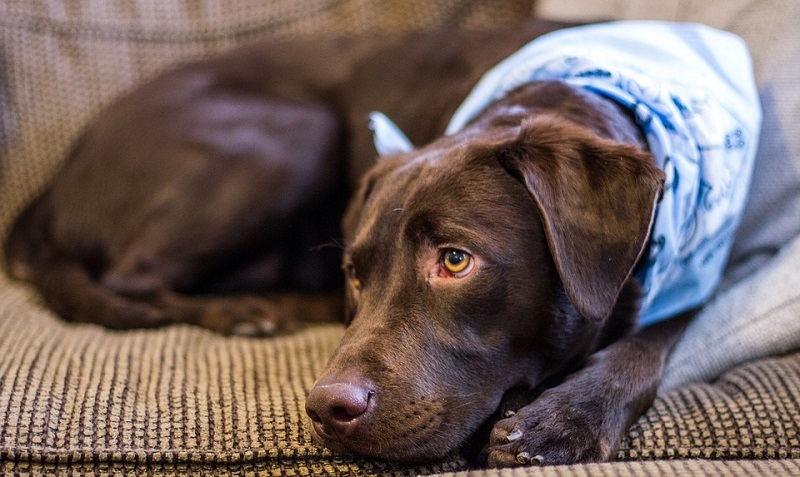 If you remain inconsistent about these rules, you will end up having a confused pet. So let us discuss some ways to train your dog to stay off the couch (unless you invite him to do so). Whatever it is you want to accomplish; you need to be consistent. For example, new pet owners make the mistake of themselves being unclear about their needs. The husband may allow the dog on couch when it is cold or raining outside; the wife may not want the pet on the couch or bed at all. In any case-discuss first! Decide what you are okay with and where to draw the line. If you decide never to let your dog on leather furniture or you bed then that is what you need to train your dog to follow. Once you have established these boundaries and house rules for your pet that is what you can teach your pet every time he/she forgets. Dogs are not born knowing what their humans will and won’t like; it is up to us to teach them these rules-every single time. Understand that a training plan is of utmost importance if you want a well behaved dog. Training ought to begin as soon as your fur baby arrives home. 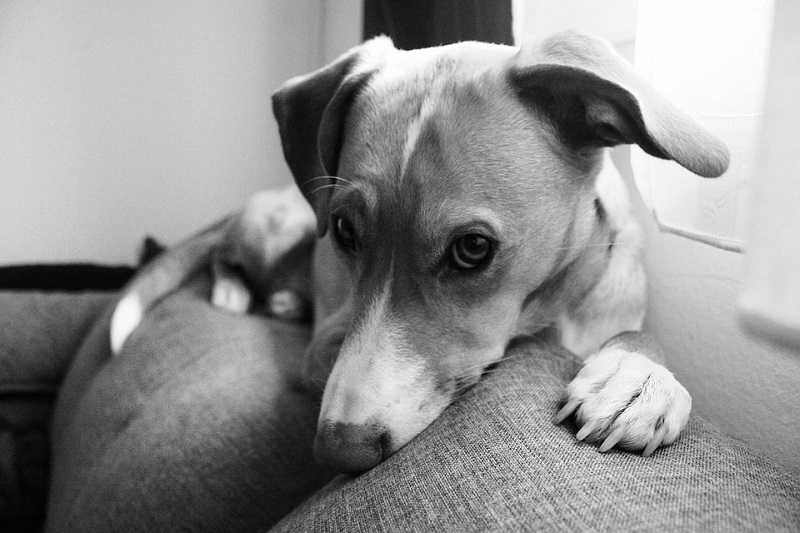 Yes, it can be frustrating for pet parents when your pet refuses to obey you. But you need to understand that when a dog defies house rules it isn’t because s/he is trying to be spiteful, mean or bad. It just means that he/she needs more training in understanding the rules and learning what is and isn’t appropriate behavior. 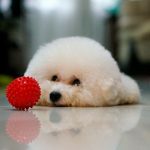 While your pet’s inappropriate behavior can be extremely frustrating, you must get one thing very clear in your mind: keep all negative and unproductive emotions out of the training process. My dog will not be allowed on any furniture-period! This is a useful rule and it includes all furniture including coffee table, bed, leather furniture etc. Once you have set this rule, the dog should know that it is allowed only in its dog bed or on the floor. When he jumps on the table, sofa or bed-he is not behaving appropriately. My dog can lie on the couch during the day when I am at work. Otherwise he should be on the floor. Likewise, he is allowed on the bed if it is cold or raining outside. He can also come on furniture when his paws are clean but if they are muddy, he must remain on the floor. These rules are bound to confuse your pet. Your dog is smart but he is not that smart that he can distinguish between these conditions. So clarify-first with yourself and with your family members about these boundaries. 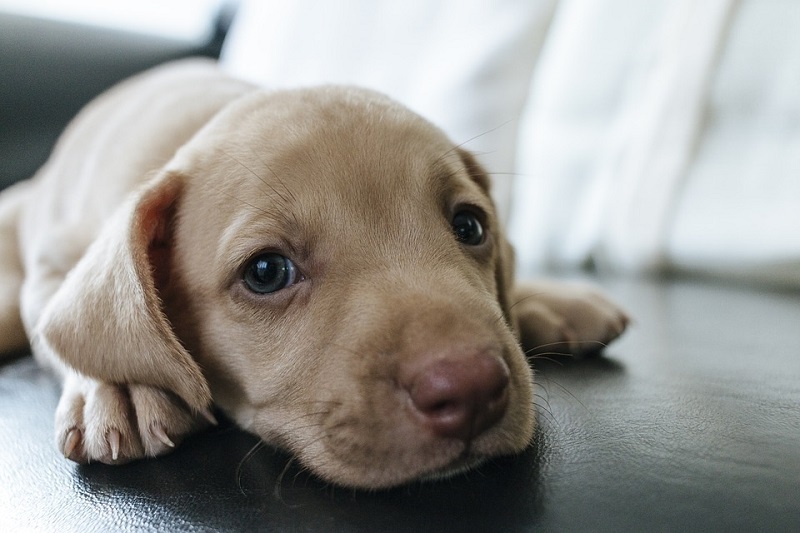 If possible, keep your dog confined to one area of the house where there is not much furniture. 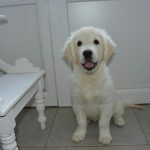 You can use baby gates to keep puppy from jumping on the sofa or bed. Train your pet to stay leashed for several hours a day. With leash training, you can easily keep your puppy from jumping on the bed, couch or leather furniture. In the beginning, you may want to keep puppy leashed to you. Later on, you can leash him in the next room. This way you can keep an eye on him in case he gets anxious. 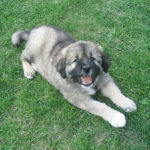 You can also try leaving puppy leashed for several hour each day preferably alone. Over time, pets get adjusted to being leashed. Always make sure your pup is safe. Keep water bowl, some toys and food within easy reach of your leashed dog. Dogs love a den like atmosphere which a crate provides. If you do not want your pooch jumping on sofa unless invited, then get him used to a crate. Buy a crate that is just the right size-neither too big nor too small. Add plenty of toys inside the crate to keep him occupied. I have discussed several crate training tips in my guide here. Always start by using the crate for short periods of time. At some point or other, every pet parent will have their baby napping on the couch. Teach your dog to stay on the floor with a clear command such as ‘Up’ or ‘off’. Your enthusiastic jumper might sometimes forget he isn’t allowed on the couch. In such cases, use the command Off to get him down. If he obeys, praise and reward him. If he is confused or resistant, have a lead and collar on him and as soon as he stands up, give a tiny jerk to the lead. Once he is on the floor, praise him and tell him he is brilliant. When you want him on the couch, pat the couch and say a clear ‘Okay, On’. As soon as he obeys, praise him warmly. He will politely start waiting for your invitation before making himself comfortable on the sofa. This is a humane solution to keep dog off couch when you are away. It also works for chairs and are easy to store. 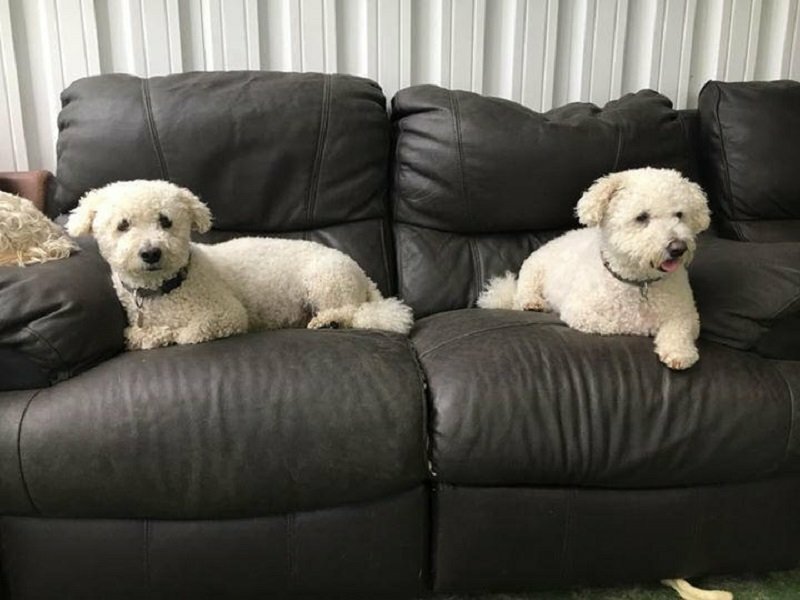 Couch defenders come in different colors and sizes and dogs are unable to move or challenge them-so your furniture stays safe. This is a must have product if someone in your family is allergic to dog hair. This is a slight hassle but a surefire way to keep dog off couch. Aluminum foil is easy to cut and mold along any surface which you want to protect from your dog. Simply cut the required section and push the foil into the edges of the sofa under the pillows. When your pet tries to jump on the foil, it will be uncomfortable for him. You can also line the couch with aluminum foil or foiled cookie trays. If your pet tries to remove them, the noise will startle him. You can also add some lightweight plastic bottles and noisy aluminum cans under the back cushions. These will startle your pet. This is a slightly inhumane but effective way to keep Fido off the couch. Sonic deterrents emit a sonic noise that startles dogs. The device gets activated when your dog places a paw on it so you need to place it strategically where your dog sleeps on the couch. Sonic defenders run on a battery. The advantage of sonic deterrents is that you can also use them on chairs, counter tops, beds, in front of doorways and near trash cans. 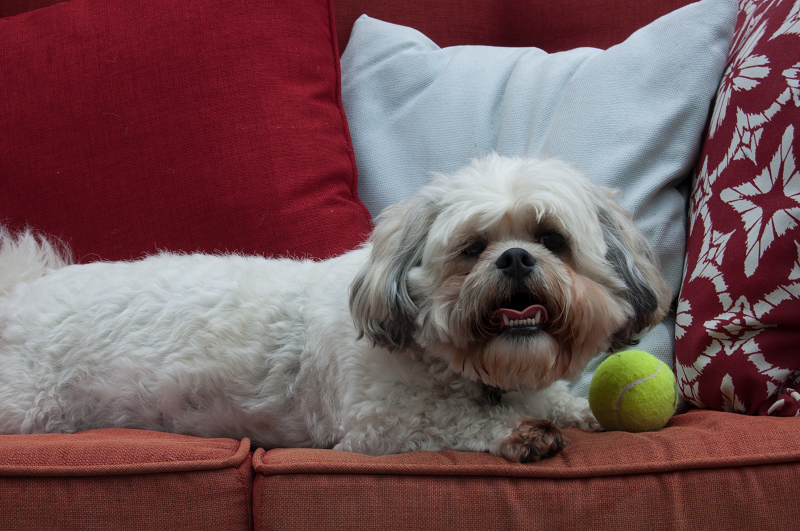 You can also keep your dog off couch using strong aromatic sprays that deter dogs. Here is a simple homemade dog deterrent couch spray recipe. Boil water and add the lemon and orange rinds and peels. Steep the solution overnight. Strain and add a cup of vinegar along with a few drops of essential oils. Spray the solution on the couch from time to time to keep your dog off couch. You can also use this spray to keep your dog off the bed.